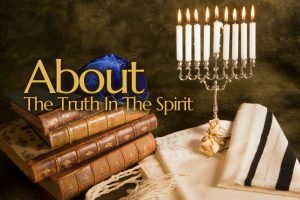 The Truth In The Spirit strives to serve all of God’s people, both Jews and Gentiles. We are sensitive to the needs and culture of the children of Isra’el while expressing the Jewish roots of the Christian faith. Unless otherwise noted, Scripture quotations on this website are taken from the Complete Jewish Bible, copyright 1998 by David H. Stern. Published by Jewish New Testament Publications, Inc. www.messianicjewish.net/jntp. Distributed by Messianic Jewish Resources. www.messianicjewish.net. All rights reserved. Used by permission. Noted scripture quotations are taken from the HOLY BIBLE, NEW INTERNATIONAL VERSION®. NIV®. Copyright © 1973, 1978, 1984 by International Bible Society. Used by permission of Zondervan. All rights reserved.